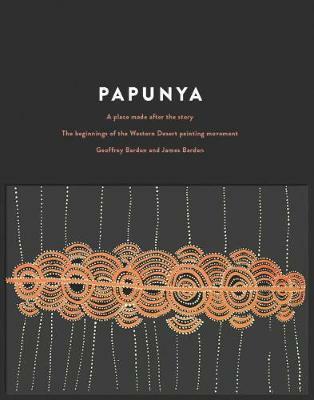 Papunya- A Place Made After the Story is a first-hand account of the Papunya Tula artists and their internationally significant works emanating from the central Western Desert. This momentous movement began in 1971 when Geoffrey Bardon, a hopeful young art teacher, drove the long lonely road from Alice Springs to the settlement at Papunya in the Northern Territory. He left only eighteen months later, defeated by hostile white authority, but a lasting legacy was the emergence of the Western Desert painting style. It started as an exercise to encourage local children to record their sand patterns and games, and grew to include tribal men and elders painting depictions of their ceremonial lives onto scraps of discarded building materials. With Bardon's support, they preserved their traditional Dreamings and stories in paint. The artistic energy unleashed at Papunya spread through Central Australia to achieve international acclaim. These works are now regarded as some of Australia's most treasured cultural, historical and artistic items. The publication of this material is an unprecedented achievement. Bardon's exquisitely recorded notes and drawings reproduced here document the early stages in this important art group. This landmark book features more than five hundred paintings, drawings and photographs from Bardon's personal archive. It tells the story of the catalyst for a powerfully modern expression of an ancient indigenous way of seeing the world.